MAKO MY DAY: Evan Michaelides with the shark he caught off Barwon Heads. 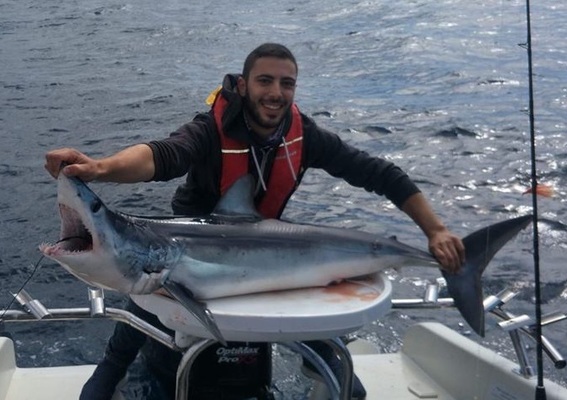 Mako sharks were high on the hit list over the past week with a number of quality fish boated locally. Evan Michaelides fished off Barwon Heads in 50 meters of water where, with the use of a strong berley, he raised a number of makos. Using a whole yakka as bait, he hooked a solid shark that gave him a run for hisr money before being brought on board. A number of other anglers reported similar stories over the past week, with numerous sharks coming up in their berley trails. Gone Fishing Charters’ Chris Vasilevski guided clients onto kingfish in excess of 10kg in The Rip while using whole squid as bait. Anglers fishing offshore from Point Lonsdale to Barwon Heads caught good numbers of just-legal- sized rat kingfish and salmon over 3kg on knife jigs and squid strips. Pinkies to 45cm were thick throughout Corio Bay’s inner-harbour, providing fantastic land-based options along Geelong’s waterfront. Casting soft plastics on first or last light and even into the dark resulted in some anglers landing a dozen or so pinkies, along with the odd flathead too. Walking along the waterfront while casting into the deeper water is a good way of locating schooling fish. Anglers wanting to use bait should find pilchard and bluebait effective. Whiting and squid were still fishing well across the Bellarine Peninsula from Clifton Springs to Queenscliff. Pippie and tenderized squid fished on a moving tide worked well for the whiting, while squid took size 3.5 white jigs cast over weed beds. Ballarat’s Lake Wendouree produced some fantastic redfin fishing for anglers casting lures from both boats and the bank. Being a shallow lake, lures that run to a depth of 1m or so work well, along with lightly weighted soft plastics, on redfin nudging 50cm along with the odd trout. Lake Purrumbete produced big brown trout again, with lucky anglers catching a number of fish from 6lb to 8lb and one specimen breaking the 11lb mark. Trolling Tassie Devils on first light then running lures a bit deeper throughout the day put anglers in with a chance of hooking up one of the big trout.